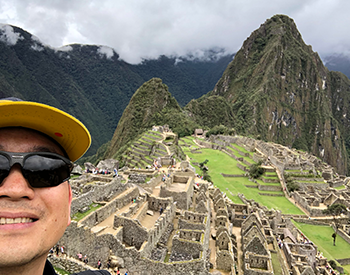 In this series, we ask alumni from the UC San Diego School of Global Policy and Strategy (GPS) to share a more personal side of themselves by answering seven or more questions from a potential list of 15. This will be a quarterly spotlight with the alumna or alumnus in the spotlight passing the “virtual pen” to the next person. 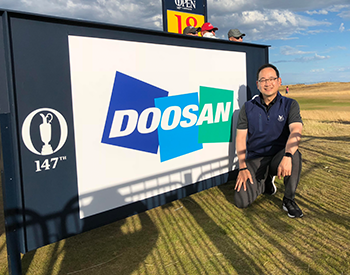 This month we feature alumnus Scott Park, MPIA '90, who currently works as the president and CEO of Doosan Bobcat Inc., an industry leader in the engineering, manufacturing and marketing of construction equipment, representing the world-renowned Bobcat, Geith and Doosan brands. Park also serves on the International Advisory Board, which was formed in 1986 to aid the dean in achieving the vision and mission of the School. With more than 30 years of industry experience including 16 years in the machinery industry, Park oversees a manufacturing footprint in over three continents and a staff of approximately 7,000 team members. 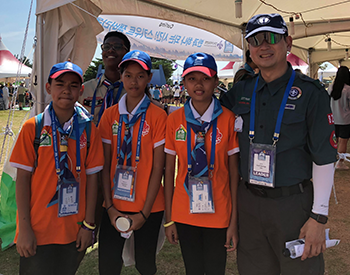 Living in Seoul, South Korea, he fondly remembers the San Diego summers and the collaborative nature of his globetrotting cohorts, which he keeps in touch with via various alumni gatherings. Read on as he shares highlights of his career and how he uses his GPS toolbox along the way. Q: What has been a highlight of your career so far? A: Boring as it may sound, a highlight was completing the IPO to take Doosan Bobcat, Inc. public on the Korean Stock Exchange in November 2016. The team was just incredible as it required three round the world deals and non-deal roadshows that resulted in literally hundreds of one-on-one meetings in Seoul, Hong Kong, Singapore, London, New York, Boston, Chicago and San Francisco! Timing was bad with the presidential elections and economic uncertainty resulting in wild rides in the stock market, but the team pulled it off! A: Working collaboratively with fellow students to assist them through Quantitative Methods (QM). Most of the then “IR/PS” students had a liberal arts background and therefore struggled a bit in QM. Being an engineering geek, I thought I’d offer an evening session to help some fellow students out. Turns out, more colleagues came than expected! I really enjoyed being able to help them out. Q: What’s the best piece of advice you’ve received (professional or personal)? A: This advice came from my boss back in 1987 while I was working in a consulting firm. He told me to picture a bucket full of water. The water represented your work/organization/project. Now, place your fist in the bucket (the fist is you). When you move your fist around, the water in the bucket moves around based on your movements - you’re impacting and influencing a lot... Now remove your fist, the void is immediately filled. He basically told me that an individual can have a tremendous impact on an organization, but no one is irreplaceable. Work hard, make a difference and stay humble. Q: What did you learn at GPS that has been most useful in your career? A: Writing political and position papers. I never really had that type of experience before. It really helped me with my writing skills. I didn’t realize how different it was to maneuver through these types of prose versus writing technical papers. Q: What do you like to do to relax on weekends? A: For the moment, there is no time to relax. Since I’m on the road so much, the weekends or any downtime is spent with family, though it’s never enough. My younger daughter is involved with a part of the Boys Scouts called Venture Crew. By default, I am an advisor, which means I get to camp out in the heat, rain, cold and cook food with a bunch of teenagers while trying to make it a meaningful experience for the kids. Needless to say, there is not a lot of time to relax! A: It will be my job after retirement. I don’t think I’ll ever quit working but when I retire, I will remove myself from this craziness and move on to something that has a direct impact on the betterment of society and lives. Even though our business today is really making a positive impact on people’s lives, I would like to find something which grabs me so emotionally that I would be fully vested in it. My dream job would be giving back on a daily basis. Q: What do you miss the most about your days in San Diego (or more specifically GPS)? A: The weather! I didn’t realize how good I had it until I moved to Korea and Belgium! Belgium is the worst when it comes to trying to get some sunshine and Korea has some other issues. Of course, there are other benefits of being in San Diego but the weather is what I miss the most. Q: Who would you like to pass the pen to and why? A: I would like to pass the pen to Greta Paa-Kerner ‘96, otherwise known as grandma since she was the only one who was somewhere in between the young grads of GPS and myself (clearly grandpa)! We were supposedly wise grandpa and grandma of the chapter. We first met around a decade and a half ago as we, along with other alums, established the European chapter. We were the travel and gourmet chapter!